Our line of floor, pallet, and low-profile scales includes a wide variety of industrial scales with weighing ranges from 600 kg to more than 25,000 kg. 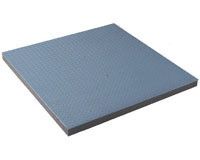 The rugged weighing platforms are suitable for daily use in dry and wet areas. Available in mild steel, galvanized or Stainless Steel options with 304 or 316 options. Plus, many models are approved for operation in ATEX / EX hazardous areas. By combining these scales with our wide range of operating terminals, we can offer you effective system solutions of p to 6000 divisions. Euroscales offer a comprehensive range of high quality industrial platform scales to meet the needs of the majority of users static weighing requirements with options for floor mount, ramps or pit frames.